Minnesota's Jason Kubel (13), the team's likely designated hitter, batted .216 with five home runs and 32 RBI in 97 games with Arizona and Cleveland last year. The ninth and final part of our nine-part series previewing each position for the Minnesota Twins takes a look at the designated hitter and bench. A few former Twins are back in the fold in today’s preview. 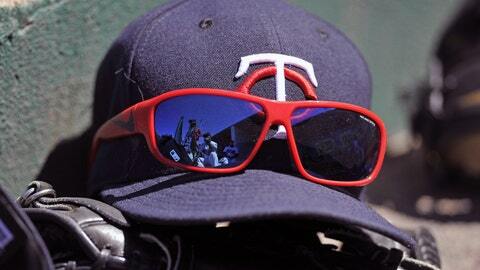 The Twins didn’t rely on just one player as the designated hitter in 2013. In total, eight different players spent time at DH for Minnesota last year, with Ryan Doumit serving the DH role more times (47 games) than anyone else on the Twins’ roster. While Doumit was a catcher and could also play the outfield, he was called upon often as the designated hitter. On the year, Doumit hit .247 with 14 home runs, five of which game as a DH. Left fielder Josh Willingham was penciled in 35 times as the designated hitter in 2013, while Joe Mauer spent 29 games at DH when he needed a day off from catching. First baseman Justin Morneau was Minnesota’s DH in 12 games, while Colabello did so 11 times. 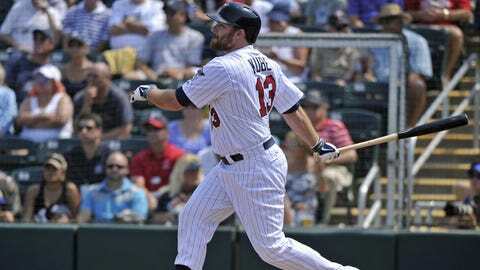 The Twins also used a combination of Oswaldo Arcia, Trevor Plouffe and Pinto for 18 total games at designated hitter. Minnesota’s bench was constantly in flux throughout the 2013 season. By the end of the year it was comprised mostly of September call-ups with little to no big league experience, such as Colabello, Doug Bernier and Chris Herrmann. The Twins never really had a ton of pop off the bench. Chris Parmelee had the most pinch-hit at-bats last year (13) but had just two hits in that scenario. Doumit was 1-for-12 as a pinch hitter, while Wilkin Ramirez was 2-for-12. Arcia was the only player to hit a pinch hit home run — one of his two hits in six pinch-hit at-bats. With Doumit gone — he was traded this offseason to Atlanta — someone else will be getting the at-bats he had as a designated hitter. That will likely fall to Kubel, who spent seven years with Minnesota before playing for the Diamondbacks and Indians the last two years. The 31-year-old Kubel is capable of playing either corner outfield position, but the Twins will probably play Arcia in right field for most of the season while Josh Willingham will likely be the regular left fielder. Of Kubel’s 3,324 career at-bats, 1,183 of them came as a designated hitter. Kubel is a career .270 hitter with 43 homers as a DH. The biggest surprise on the Twins’ bench this year is Bartlett, who was out of baseball entirely in 2013 as he recovered from a knee injury. During his nine seasons with Minnesota, Tampa Bay and San Diego, Bartlett played all but one game at shortstop. Still, the Twins believe Bartlett can be a "super utility" player and even spend some time in the outfield despite having never played in the outfield at any point in his career — majors or minors. Given that Minnesota doesn’t have a true backup option in center field, it could be a patchwork effort if starting center fielder Aaron Hicks gets hurt or needs a day off. Bartlett may have to fill in for a game or two in center. Escobar figures to be the top utility infielder as he’s able to play second base, shortstop or third base and can also play the outfield if needed (he’s played two games there in three years). Colabello, meanwhile, has a chance to be the Twins’ backup first baseman behind Joe Mauer as well as a part-time DH. Colabello spent seven seasons playing independent ball before making his major-league debut last year with Minnesota. He put up impressive numbers at Triple-A Rochester in 2013 (.352 with 24 homers and 76 RBI in 89 games), but struggled a bit to adjust to big league pitching. If he can come close to being the hitter he was for Rochester last year, Colabello will be a key asset on the bench and as a backup first baseman/designated hitter. Pinto makes the team as a backup to catcher Kurt Suzuki, but the 24-year-old Venezuela native could also see quite a few at-bats as the designated hitter as Minnesota would love to have his bat in the lineup on days when he’s not catching. Pinto made his MLB debut last year as a September call-up and was impressive offensively, although he still has some work to do defensively. Find a DH who can provide some power. Of all the American League teams in 2013, the Twins’ designated hitters were second-to-last in home runs with just 14 and was third-to-last in OPS (on-base plus slugging) at .634. Whether it’s Kubel or Pinto or Colabello, Minnesota will need to establish a bit more power from the designated hitter spot in the lineup in 2014.